The fifth video lecture is ready for streaming now! It provides you with all the information you need for writing your own goal tests that influence the way the FCG search process will come up with solutions. You can go to the latest lecture through this link. The fourth lecture of our FCG tutorial has been posted to the lectures page now. This lecture teaches you how to organize your constructions into a construction inventory and how to deal with construction inventory configurations. You can download the latest FCG source code including a new range of construction templates from Babel2 website now. The demos that accompany the 2011 volume on Design Patterns in Fluid Construction Grammar are still included in the release. 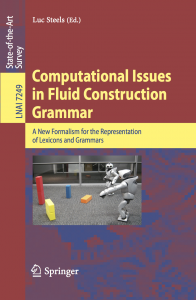 The new volume on FCG, Computational Issues in Fluid Construction Grammar has been released today at Springer. It targets readers that are interested in the technical underpinnings of the formalism (implementation, formal analysis) and in-depth case studies on challenging topics such as Polish negation, German information structure, Spanish modal scope, etc. You can now download chapters from this website.